Commissioning contemporary art for theMother Church of the Anglican Communion, the seat of the Archbishop of Canterbury, is always going to be a tall order. Those who take on the task - deans, architects and artists - require strong constitutions to deal with the inevitable criticism when such an iconic building sees change. Some of the modern commissions have, therefore, been relatively small interventions in larger and earlier works such as the bronze Christ by Klaus Ringwald in the Christchurch Gate or the continuing series of stained glass commissions for the Cloister. In addition, the fabric of the building requires very significant maintenance and repair. Brian Sewell, with his usual hyperbole, has described the building as ‘parting at the seams,’ which is understandably the primary focus of the Cathedral's fundraising programme. In between such extreme pressures the scope for significant new commissions has been less than in other settings. There is one window in the style of the Arts and Crafts movement which was created by Christopher Whall. Whall was the influential designer in this style and made this window in 1902 together with another, once in St Andrew’s chapel, that was lost during World War II. The surviving window shows the Resurrection in the centre of the top register with the archangels Uriel and St Michael on either side. In the centre register is the Agony in the Garden, with the figures of John the Baptist and St John the Evangelist flanking. In the bottom register of the window is the Nativity with St Bartholomew and St James. Whall created the jewel-like quality of intense colours by the use of thickly moulded ‘slab glass,’ known as ‘Early English,’ although it had been recently developed at that point. A further stained glass commission was for the St Anselm’s Chapel. This came when Harry Stammers, a well-known stained glass designer from York, replaced the glass lost in World War II with new brightly coloured glass in 1959. St Anselm was the second Norman archbishop between 1093 and 1109, a great theologian who initiated the building of the major extension of the earlier Norman church of Lanfranc. 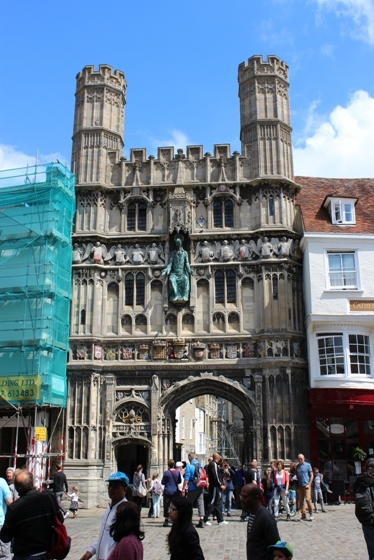 The main five lights show the five people important in his life and beneath a story connected with each (http://www.canterbury-archaeology.org.uk/#/anselm-window/4567414908). 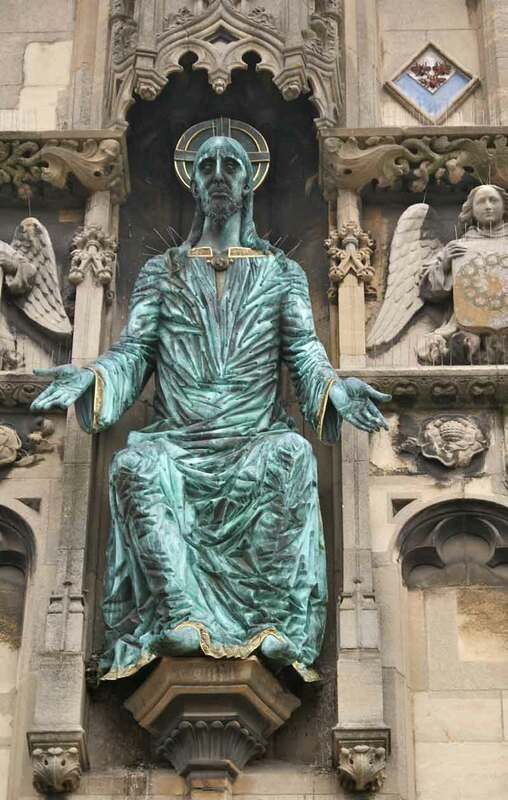 Giles Blomfield, while architect at the Cathedral created the Beckett altar in 1986 (http://www.canterbury-archaeology.org.uk/becket-altar/4567131041) in the Martyrdom with the 'Swords Point' sculpture above (where two metal swords and their shadows form the four swords which did for Thomas Becket). Blomfield also added the Compass Rose (symbol of the Anglican Communion) to the floor of the Nave's east end in 1988, when it was dedicated by Archbishop Robert Runcie during the final eucharist of that year's Lambeth Conference (http://www.canterbury-archaeology.org.uk/compass/4567213331). The Beckett altar was the first new altar in the Cathedral for 448 years but was rather more swiftly followed in 2005 by the St Anselm's altar which is the work of sculptor Stephen Cox (http://acetrust.org/ecclesiart/artists/stephen-cox). The altar was a gift to Canterbury Cathedral from the people of the Regione Autonoma Valle d'Aosta, the birthplace of Saint Anselm. 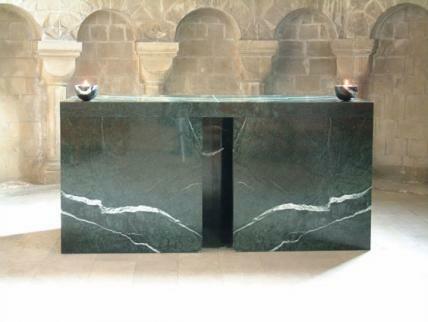 Created in Aosta marble, the altar's dark symmetric simplicity lies in stark contrast to the pale, curving stone of the chapel. In selecting the stone, Stephen Cox ensured that the beauty of the colour and unique markings told the story of the majesty of the mountainous region that is Aosta and honours Anselm, both as Archbishop and Theologian. Cox is interested in ‘the ‘transformational’ that occurs in art, i.e. that mundane materials through a sequence of actions are transformed into a whole different area of understanding. In the same way, he states, his altars have been subjected to the ritual of consecration and are, in consequence, changed. Earlier plans for a St Anselm’s altarpiece involving the Hungarian born sculptor Andor Mészáros seem to have gone unrealized, although his 14 bronze medallions of the ‘Stations of the Cross’ together with a fifteenth made by his son Mikhael were completed and can be seen in the Cathedral’s Treasury (http://adb.anu.edu.au/biography/meszaros-andor-11114). Another Hungarian born artist, Ervin Bossanyi, was to have a rather better experience of a commission for Canterbury. Bossanyi’s experience illustrates some of the reasons why caution is often applied to commissions in a setting like Canterbury Cathedral, but also reveals the benefits of trusting the vision of the artist commissioned. Bossanyi was a Hungarian Jew who arrived in Britain in 1934 having gained a significant reputation for himself in Hamburg across the disciplines of ceramics, murals, paintings, sculpture and stained glass. His most significant commission to that point had been stained glass windows for the Ohlsdorf crematorium, which had been designed by Fritz Schumacher. However, when the Nazis gained power shortly after this commission was completed, Schumacher was suspended as Chief Architect of Hamburg and Bossanyi's promising career there was ended. He came to Britain with a reference from Schumacher but that counted for little and Bossanyi struggled initially to find commissions. There were two turning points. First, he gained the support of Charles Holden, an architect who had championed the early work of Jacob Epstein, Eric Gill and Henry Moore. Holden helped Bossanyi gain commissions for Goldsmith's Library and Uxbridge Station. Second was the creation of a window for the Tate Gallery which was eventually installed in 1948. Bernard Rackham from the V&A was among those who had supported Bossanyi over the Tate window. He also introduced Eric Milner-White, who became Dean of York Minster, to Bossanyi's work by means of this window. After repeated viewings Milner-White was convinced of Bossanyi's genius and recommended him to the Revd. C.T. Wood, Director of the South African Church Institute, who commissioned Bossanyi for windows at MichaelhouseSchool in Balgowan, Natal. Wood was a friend of the Archdeacon of Canterbury and, when the Cathedral was planning to re-glaze windows in the south-east transept, took the Venerable Alexander Sargent to meet Bossanyi. Rackham, who had authored two books on Canterbury's stained glass, also commended Bossanyi, who in 1935 was invited to meet the ' Red Dean' Hewlett Johnson. The two men hit it off immediately and the subsequent commission explored themes to which both were deeply committed: peace, salvation, faith and action. In the first window, dedicated to unity and peace and conceived throughout in radiant colours, the ascended Christ welcomes children of all races. In the second, four prisoners are raised up from the leaden hues of darkness and despair into a glittering freedom where butterflies and birds take flight. Above these two are smaller upper windows: 'To the east is Christ Walking on the Waves, with Christ walking on stormy waters, representing faith, and to the west St Christopher, representing action' (Ervin Bossanyi: Vision, Art and Exile, ed. J. Bossanyi and S. Brown, Spire Books Ltd, 2008). Bossanyi is similar to Marc Chagall in that, while his stained-glass commissions often required the use of specifically Christian imagery, he recognized the 'profound inspiration' of all the great religions, possessed a 'reverence for life' and longed for a 'new cosmopolitan world order, in which ideological, racist and cultural differences no longer mattered.' Where his work differs significantly from that of his peers is in the influence of Asian and in particular Indian art on his own designs. The Canterbury windows, which Bossanyi considered to be among his finest work, led to further major projects including commissions for the National Cathedral in WashingtonDC. On my sabbatical art pilgrimage I have greatly appreciated the opportunity to see work by Bossanyi at St John's College Chapel in Oxford, the Stained Glass Museum in Ely Cathedral and the Sacred Silver and Stained Glass Gallery at the Victoria & AlbertMuseum. At Canterbury, as Casciani notes, ‘Bossanyi was given that rare thing for a stained-glass artist – a free hand to interpret his own themes – and for Canterbury he chose those dearest to his heart: peace and salvation.’ The obituary for Bossanyi published by theDaily Telegraph summed up his work well in saying that he had ‘brought a flood of colour to the world’ (Daily Telegraph, 1 October 1979).